Meigs freshman Coulter Cleland releases a pass behind a block from sophomore Noah Metzger, during the Marauders’ setback on Oct. 12 in Rocksprings, Ohio. Last Week: Southern lost to Trimble 51-0, in Racine; Eastern lost to Belpre 30-7, in Belpre. Last meeting between the teams: Oct. 28, 2017. Southern won 28-0 in Racine. SHS offense last week: 30 rushing yards, 4 passing yards. SHS offensive leaders last week: QB Logan Drummer 2-of-11, 4 yards, 1INT; RB Logan Drummer 9 carries, 16 yards; WR Trey McNickle 1 reception, 2 yards. SHS defense last week: 328 rushing yards, 82 passing yards. EHS defense last week: 275 rushing yards, 5 passing yards. 2. Both teams have four-game winning streaks to highlight their seasons. Southern has outscored its nine foes by a 331-to-204 count, while Eastern has been outscored 195-to-135 by its nine opponents. 3. Of their seven common opponents, both teams defeated South Gallia, Federal Hocking, Wahama and Miller, while falling to Trimble, Waterford and Belpre. EHS went 0-2 in non-conference play, while SHS was 2-0. 4. Last week, Southern was shut out for the first time since Week 4 of last season. Eastern was held to one touchdown for the third time this fall in its Week 9 setback. This is the first time since 2015 that the Tornadoes and Eagles battle when both are coming off a loss. 5. This is the battle for fourth in the Tri-Valley Conference Hocking Division. The team that comes in second on Saturday will settle for fifth in the nine-team league. Last Week: Meigs defeated Wellston 28-26, in Rocksprings; Alexander lost to Warren 21-18, in Vincent. Last meeting between the teams: Oct. 27, 2017. Meigs won 40-0 in Rocksprings. MHS offense last week: 142 rushing yards, 140 passing yards. MHS offensive leaders last week: QB Coulter Cleland 10-of-18, 124 yards, 1TD; RB Abe Lundy 13 carries, 56 yards, 2TDs; WR Zach Bartrum 4 receptions, 37 yards. MHS defense last week: 135 rushing yards, 32 passing yards. 1. The Marauders own a 28-5-1 record over AHS in all-time meetings. Meigs claimed a 41-15 victory in its last trip to AHS, on Oct. 28, 2016. 2. Meigs has ended the regular season with a win in 11 of the last 15 years. The Marauders will be trying to end the regular season with a two-game winning streak for the first time since 2014 and the 15th time in school history. Meigs is 35-14-1 in all-time regular season finales. 3. 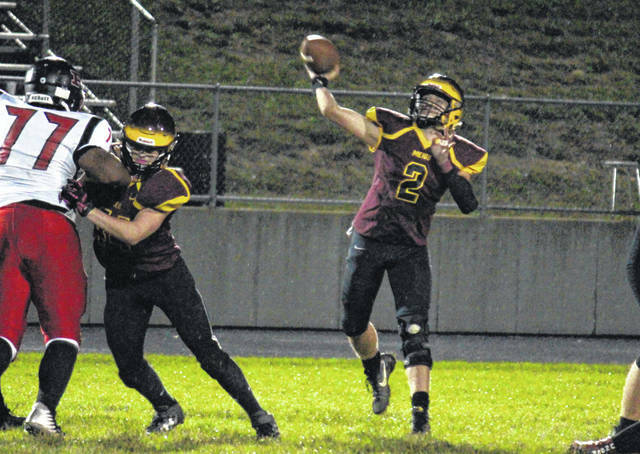 The Marauders put two touchdowns on the board in the final period of last week’s two-point win, ending Meigs’ fourth-quarter scoring drought at eight games. Meigs has a pair of one-possession wins this fall, matching its total from each of the last two seasons. 4. Three of Alexander’s four wins have come against teams who enter Week 10 without a victory. Vinton County is the only team with a win that AHS has defeated, doing so in overtime. Meigs also defeated the Vikings in overtime this season. 5. The Marauders can still finish tied for second in the Tri-Valley Conference Ohio Division. Meigs needs to win, and for Athens to defeat Nelsonville-York to put MHS and NYHS at a tie for second at 4-2. An Alexander victory would tie the Spartans, Marauders and the winner of Wellston and Vinton County for third in the TVC Ohio.